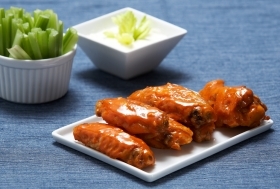 Have you made Buffalo Turkey Wings? 1. Cut off wing tips; reserve for other use. 2. Cut wing into 2 pieces at joint. Combine flour, salt and cayenne pepper on a plate. 3. Dust wings in flour mixture, shaking off excess. 4. Heat 1-1/2 inches of oil in large skillet over medium heat. 5. 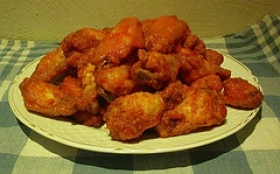 Add wings in single layer and fry, turning once, until browned, 10 minutes; drain on paper towels. 6. Repeat with remaining wings. 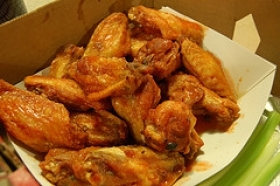 Combine butter, vinegar, and hot pepper sauce. 7. 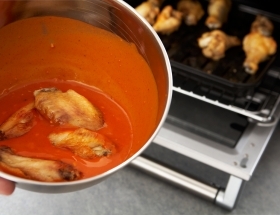 Place wings in a large baking pan; drizzle on sauce over wings. 8. 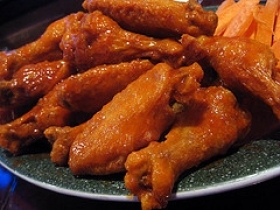 Bake in 375 oven, 1 hour, basting 4 or 5 times, turning once, until wings are browned. 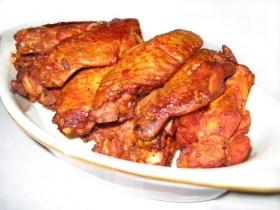 This recipe contains potential food allergens and will effect people with Wheat, Butter, Gluten, MSG, Poultry, Sulfites, Turkey, Hot Pepper, Vinegar allergies.